Sticky fingers – We’ve gotcha! If there’s something that keeps both me and bank robbers up at night it’s the art of not leaving a trace. You see, fingerprints are a big issue for criminals, the people trying to catch them and for manufacturers of industrial film. The reason for this, well for manufacturers of industrial film that is, it just simply isn’t a good look if the otherwise sleek interior of your car is sullied by the presence of grimy fingerprints all over the place, or if your touchscreen is covered in smears. This is why we’ve been spending a lot of time thinking about how you can eliminate fingerprints all together – if indeed you can. If you get up close and personal with a fingerprint you’ll find a whole host of interesting ingredients. On a chemical basis finger grease – to coin a technical phrase – contains a variety of different chemicals including squalene, hexadecanoic acid, oleic acid and geranylgeraniol, but the biggest inorganic presence in your fingerprint is mainly chlorine from salt. 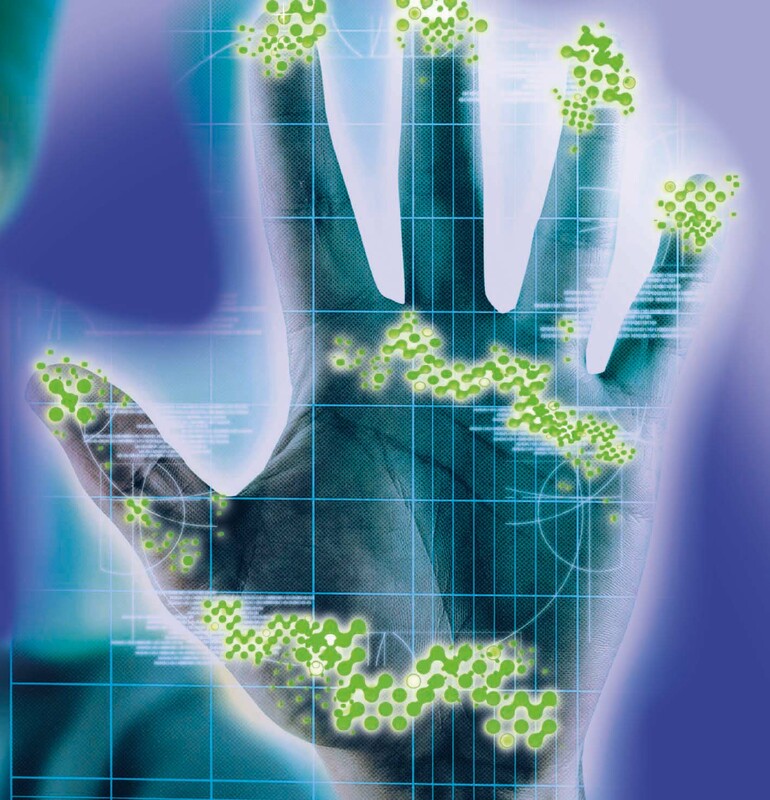 Fingerprints vary from person to person and depend on the temperature and humidity, but broadly speaking they contain similar chemical components. But what does this mean for someone who is trying to prevent fingerprints from appearing on a touchscreen? Well, bluntly that means a fingerprint resistant film will have to resist water and oil at the same time while maintaining hardness and any other inherent feature. We like to refer to this complex set of versatile features as omniphobic surfaces, by the way. We’ve been doing a lot of testing on this issue and ultimately it’s a question of angles. Surfaces with high contact angles and low surface energy resist fingerprints because when a liquid comes into contact with it, it beads rather than spreads. If you combine this with omniphobic components such as polymers you can get somewhere close to a fingerprint resistant surface. This is exactly what we have been doing at MacDermid Autotype for our Film Insert Moulding films, used in both the telecoms and the automotive industry. What we’ve come up with is a product which includes an anti-fingerprint hardcoating covering a PMMA layer, or PC layer and PC injection resin – ideal for those modern lustrous car infotainment units for example. But here’s the bad news for car burglars. High contact angles and omniphobic polymers will only get you so far: ultimately we all carry grease on the tips of our fingers and fingerprints cannot be eliminated, only minimised. So if you really wanted to rob a bank, or a car, wearing gloves would still look like a good bet.